Wondering what to watch tonight? Check out this list (organized by model). Season 2, Episode 2: "I Like Kettlecorn"
Season 3, Episode 5: "Feces are my Purview"
You can also search through all the user submitted Lego content with the Volvo tag in the website search bar. 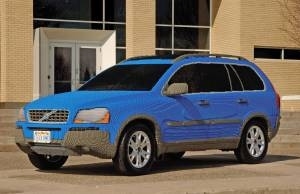 Feel inspired to make your own Volvo Lego creation? Various Volvo scale-models ready to be printed, cut, and pasted (zip and jpg files). You can personalize the colors before printing out. 2016 Note: Website temporarily down? Looking forward to the next Volvo Ocean Race Game? Strongest Truck, Version Three: "New Third Level"
Note: The links to Versions One and Two are not currently working. I will re-upload them if they start working again. Can search for games with a Volvo tag in the homepage search box. Is your network of Facebook friends global enough to get you around the world in 80 days? Play DRIVe Around The World, Volvos great new game on Facebook and find out how well-connected you really are. All you have to do is virtually drive your C30 to a Facebook friend who lives as close to 1,333 km (825 miles) away as possible; that's the distance the thrifty C30 DRIVe makes on just one tank of fuel. Then the car is passed on from friend to friend, moving from country to country, until it makes its way around the world back to you. But how many friends will you need?" "The various teams' routes round the world can be followed on Volvo's Facebook page. The winning team's reward will be in the form of a donation of 15,000 Euros to a carbon offset project through the organisation myclimate for the purpose of reducing global warming. Myclimate works according to the Gold Standard, which is certified by the U.N. and has been formulated by, among others, WWF International and Greenpeace International. The donation is enough to neutralise the amount of carbon dioxide generated by the average person during a long lifetime. For each additional driver Volvo Cars will contribute funds that are the equivalent of 99 grams of carbon dioxide, which is the level of a Volvo C30 DRIVe's emissions per kilometre. "This challenge ties in with Volvo's new campaign ‘There's More To Life Than A Volvo, that's why you drive one.' by highlighting how vital our personal connections are in making the world a better place. And when the competition is finally concluded, Volvo will have found in the winning team the world's arguably most well-connected people," says Lukas Dohle." A free game for your PC! Volvo The Game: Now Released!